This is our middle child – #3 (we have 4 total). He is a very active boy. He is curious and very vocal as well. The only thing is that he doesn’t say too many words yet and the words he does say don’t always make much sense. I constantly try to practice sounding out words with him, and he is really not interested. Every once in a while he will repeat something, but it is immediately forgotten and he goes back to being a playful boy. At our last pediatrician appointment, the doctor showed concern that he was not up to the level that children his age should be at with talking. He should be saying 25 words, not 5. But for some reason, I don’t feel this sense of urgency to get my child help right now. Is this wrong? I have heard of children not talking at all at his age, but my son is so vocal. He has no trouble there. I did speak with the principal at my oldest son’s school and she gave me the # for a speech therapist. I am totally open to this, but I would really like to wait a few months to see if he progresses. If he doesn’t progress, then I will definitely set up an appointment and get him checked out. If you have checked “No” for one or more of the items above, your child may be at risk for language, learning or reading problems later. Here are some helpful resources that will help you determine if your child is in need of help with their speech development. BabyCenter.com – What are the indications that my toddler needs a speech therapist? I will definitely keep you posted on how things go. I am also open to any of your advice or suggestions as well. Thanks so much! Hello, I chuckled a bit when I read your post, not in a bad way but because I am going through the same thing with my son. He will be 3 next month and up til a couple months ago, he didn’t say ANYTHING. Not even momma or dadda. All he did was point and scream and if he didn’t point it was a full blown tantrum. I have 4 kids too. 3 under the age of 3 and then a teenager. I didn’t feel any sense of urgency either except for the fact that he threw horrible tantrums when he couldn’t “communicate” what he wanted and it caused a lot of stress and problems in our house. He has been going to therapy since December and he has made progress but not as much as I thought he would have and I just think he is not ready. Our therapist tells me that about 95% of the children she sees and the therapists see are boys, it is just normal for them to be so delayed. My son sounds exactly like your son. So no I don’t think it’s bad you don’t have a sense of urgency. I think he will talk when he is ready. I believe my son will talk when he is ready, I just think he needed a but of help too because of how upset he gets. Him being able to communicate a little more has calmed him down a bit and there is not so much stress in the house. He’s so cute! My youngest brother and sister had speech delays. My mom finally took them both to see a therapist when they were 4 and 2 respectively. It was amazing how quickly they progressed after a few sessions. My sister (now 14) shows no signs of ever having a speech delay, but my brother (now 16) has a slight mumble still because he didn’t receive early intervention. My mother didn’t start him sooner because of the social stigma. My 3rd child, a boy, who is now 19 (ha) didn’t talk a whole lot when he was a toddler either. I think it has something to do with having older siblings. My two older children are 7 and 6 years older than my son, and I think they actually did the talking for him. When he wanted something, he could get it from the older kids by pointing and grunting, or they would come and tell me what he wanted. Instead of me making my son tell me himself, he got what he wanted through them. My son never had a speech problem once he did begin talking, but he was diagnosed ADHD at the age of 9 or so. Not that that has anything to do with him not talking, because I don’t think it does, but I thought I’d mention it because you never know. I wouldn’t jump into getting speech therapy just yet either, if it were me. Just continue to encourage your son to use words when he wants something. If you don’t see any improvement over the next 6 months, then I might look into getting him some help. Thanks so much Toni for sharing with me about your experience with getting help for your daughter. This really helps me to see the importance of seeking therapy for my son. I appreciate you taking the time. This is exactly what I have been going through with my son. I forgot to mention that he gets very frustrated that he cannot communicate. I appreciate you sharing your experience with me. It helps me to see that I should probably seek help as well. Thanks! Thanks so much Teresha for taking the time to comment and share about your siblings. I have gotten some really great comments from my readers and I am seeing more and more that I should seek help sooner than later. Thanks again! I happen to stumble here while looking for some pictures of busy moms. I have a 22 year old who had speech problems early on (age 3). My mother didn’t speak until she was four or five, so we didn’t rush into anything. His preschool teachers suggested a screening since he was speaking plenty of words, but they almost sounded Klingon! Ends up, he had an under-developed muscle in his tongue and after a year of speech therapy, he was fine! Don’t let social stigma keep you from anything having to do with your kids! Thanks! Thanks so much Liz. I really appreciate your insight. You are so right! 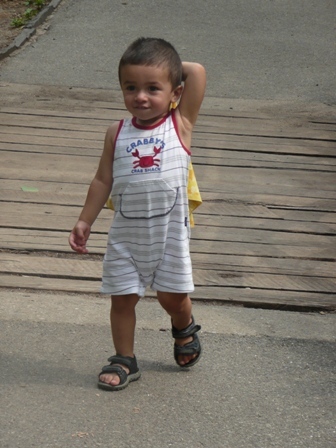 My two year old son, he’ll be three in August, takes both physical and speech therapy. His vocabulary started out with the words “mama” and “dada” but now he doesn’t say either one of them anymore. His language skills are a combination of pointing and making noises as well. As his mother, I can automatically tell what he wants but because he goes to a special preschool it’s important now for them to understand what he wants. He gets both of his therapies at his school, and although I have noticed a vast improvement with his physical needs his vocal needs are still not improving yet. I suggest that you get your son into intervention as soon as possible. We waited too long and now his speech is delayed really bad. If you are a little skeptical about it, I suggest that you at least schedule an appointment with a local speech therapist and see what they have to say. Each therapist will have a different way/method that they work with children, so you may find one that you like a lot better than another one. Thanks so much Shynea. I really appreciate you taking the time to comment on my post about speach therapy. I will definitely take heed to your advice. Everyone who has commented is saying the same thing – to at least schedule an appointment to get him checked out. I am seeing that this is definitely important to take care of sooner than later. Thanks again for sharing your thoughts. And I hope that everything works out with your son as well.